I warmly welcome to the Chinese Embassy CACH members and families. Your organisation, Children Adopted From China, provides an important network of support for children born in China but brought up in Britain. So it is my great pleasure to say to you all - welcome home! · You grow up speaking English. · You live in British families. · You have loving British parents. · Yet your black eyes, black hair and dark skin all remind you that you are Chinese. · Your birth in China means you will always be part of the whole Chinese family. · Family in China has always been very important. · So, China will always welcome you! This means you grow up belonging to two families, and the love you get is double! For your British parents I want to pay the highest possible tribute to them. As a Chinese saying goes, 'love knows no borders'. Young people and children, what your British parents have done is a living example of this Chinese saying. · Today they are the source of your warmth and happiness. · Tomorrow you will be their joy and pride. As we gather here, I offer sincere and deepest thanks to the organisers and members of CACH. 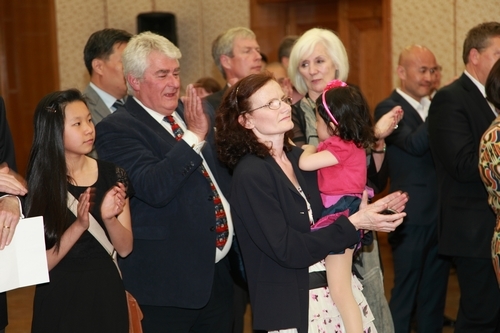 You have volunteered your time and energy to support and serve many families adopting Chinese children. · The cause of CACH is noble. · Your acts are spontaneous. · Your contribution is invaluable. · I very much hope you will get to know China very well. · As children you may just know its lovable giant pandas. · But, as you learn more you will be amazed. · I hope you will discover China's beauty and be friends with many of its hard-working people. · There is so much to gain from understanding China's long history of five thousand years. · You need to understand how China is now the world's second largest economy. · As you travel you will see China is a big country and plays an important role in the world. · China is a country to dream and to make dreams come true. · As you study, you will be convinced that you have every reason to be proud of China your country of birth. · You have to show the true meaning of gratitude. · Always keep in mind how loving and caring your parents are. · When you grow up, you should support and care for them in the same way. · I also hope you will develop the Chinese spirit you were born with. · This can be developed if you learn the Chinese language and study Chinese culture. 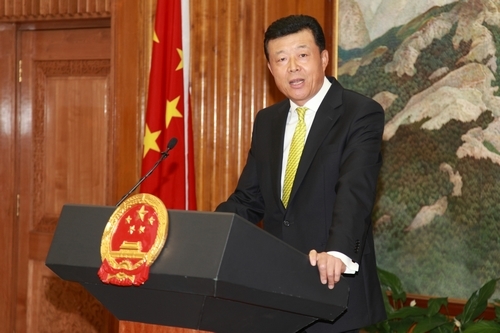 · In this way, with such a cross-cultural background, you will build bridges of friendship between China and Britain. I now wish to mention another group of Chinese children here! They also have black eyes, black hair and dark skin. Their parents are diplomats of the Chinese Embassy. You will have the opportunity to meet and play together this evening. I hope you will make friends and have a great time! In conclusion, I want to stress that the Chinese Embassy will always be the home for all Chinese children in Britain. The Chinese Embassy will also always help adopting families discover and understand China.